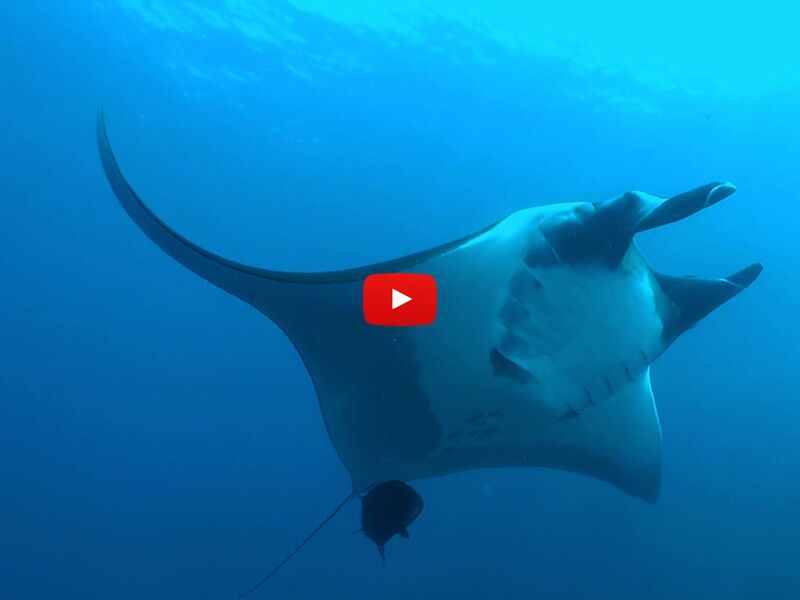 The dives from the Manta Queen 1 done in small groups of one dive guide with a maximum of 5 divers and for about 50 minutes. 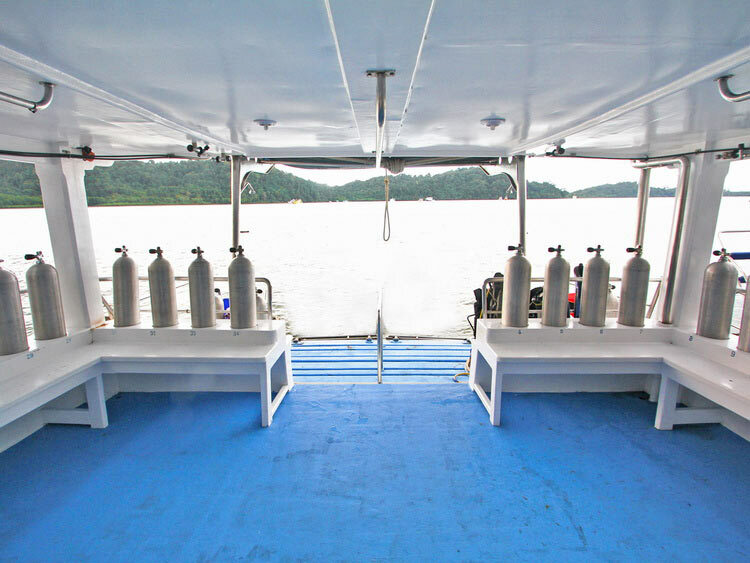 The dive groups are based on experience and certification level. 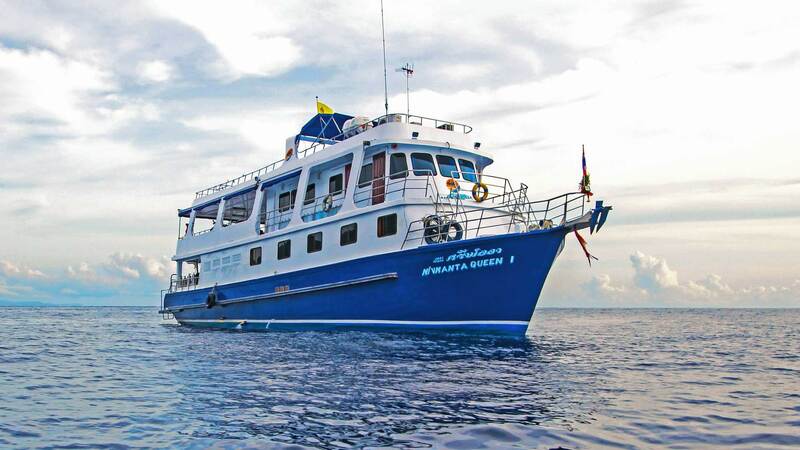 This 4 days – 4 nights liveaboard trip is suitable for divers from beginner to experienced levels. 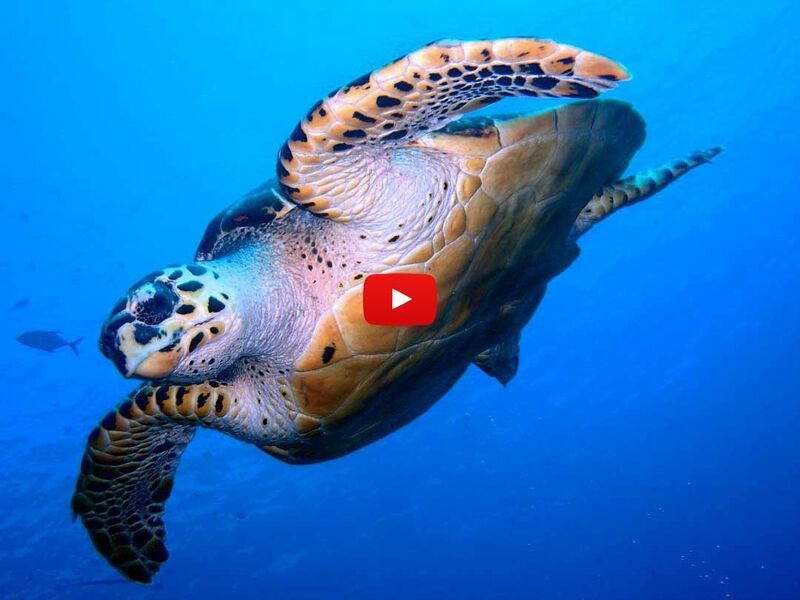 There is a wide variation across the dive sites with hard corals, bommies covered in soft coral, large granite boulders, rock walls and swim-throughs which will excite you every time again. 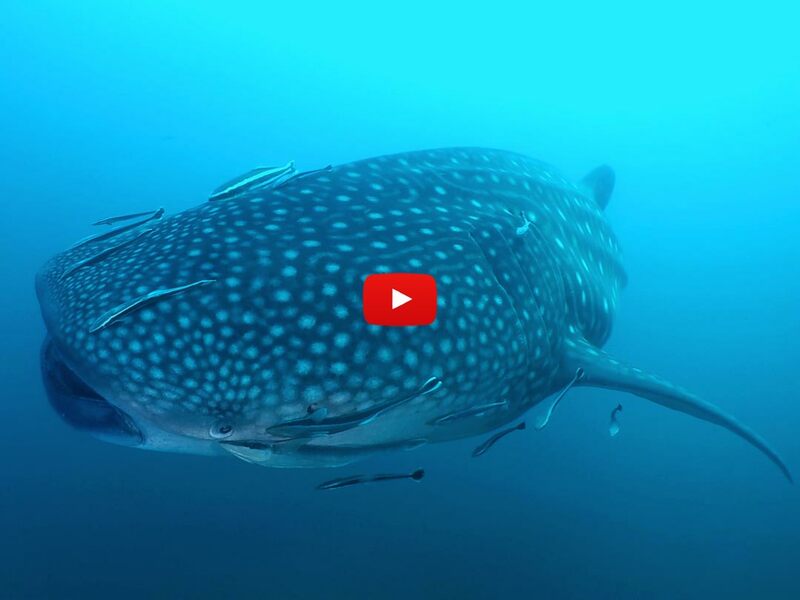 Life underwater is just awesome. 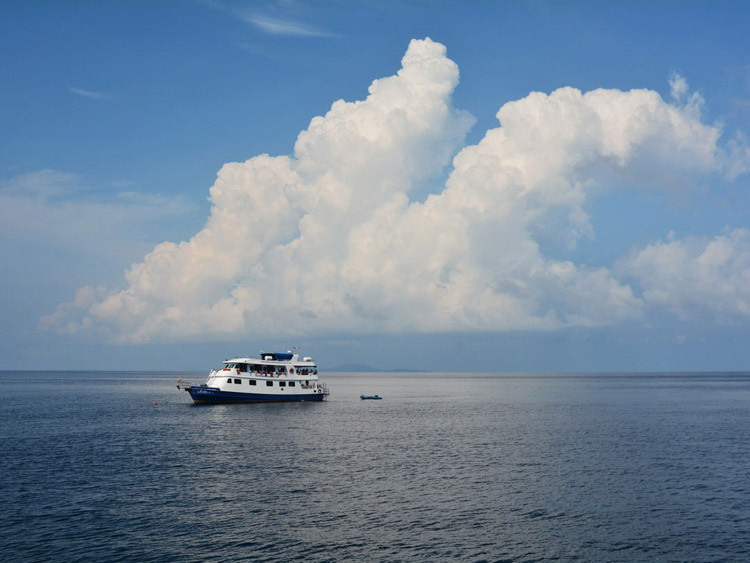 You can see big schools of barracudas, trevallies, sweetlips, snappers, emperors, fusiliers, batfish, butterflyfish, damselfish, surgeonfish, and rabbitfish but also big fish like the Napoleon wrasse, bump head parrotfish, giant groupers and triggerfish and there are good chances to meet turtles, stingrays, sharks, the giant manta rays or whale sharks! 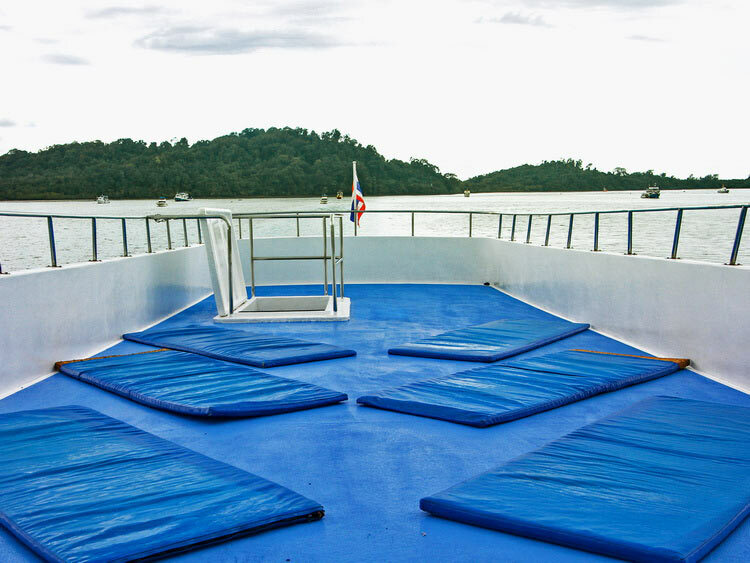 There is the large sun deck to snooze away in a hammock or get tanned (don’t forget plenty of sun protection!). The sheltered lounge with HD-TV where you can watch the videos which are made during the dives. 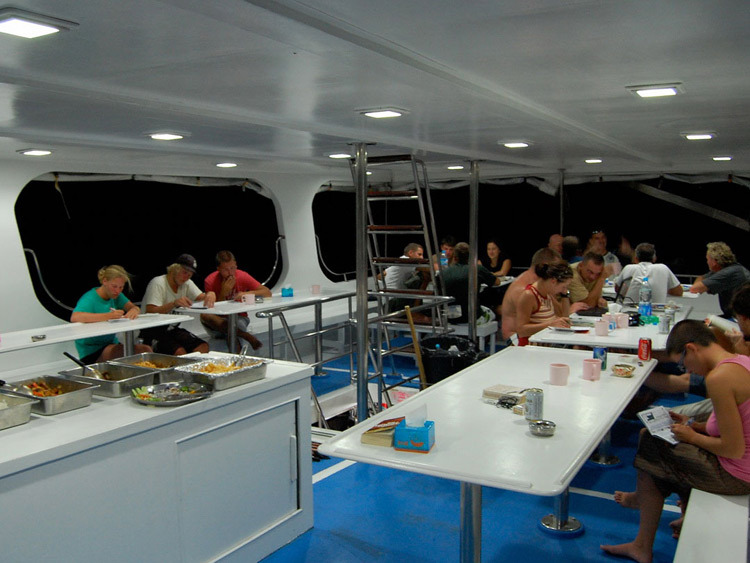 The open dining area to relax in the shadows, maybe searching in a fish guide book for the new and unknown friends you made during your dives. 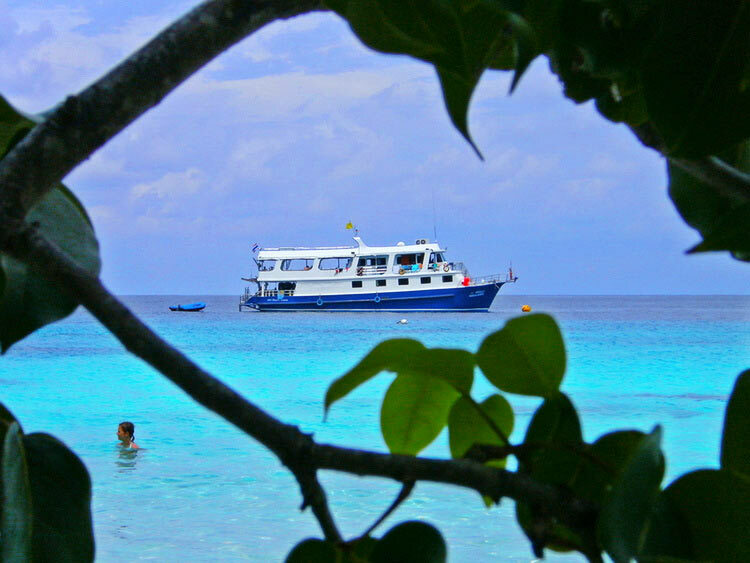 The dingy gives us the opportunity to spend some time on the beautiful white sand beaches at the Similan Islands (now only Similan Island beaches are open for visiting! ), for playing a game of football or volleyball. It’s also possible to climb up to some of the most stunning viewpoints. Imagine yourself sitting having a scenic view and watching the sky exploding in the most beautiful sunset! 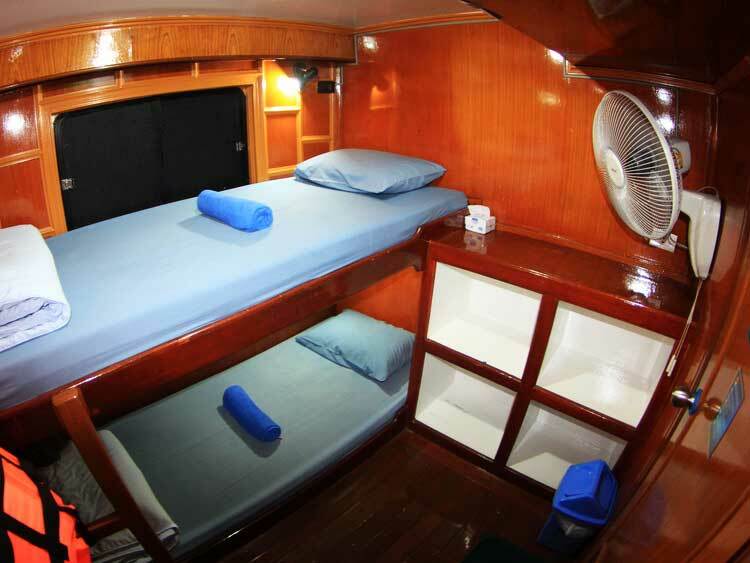 M/V Manta Queen 1 is a large 27 m long and 5 m wide wooden boat and accommodates 22 guests in comfortable air-conditioned cabins. 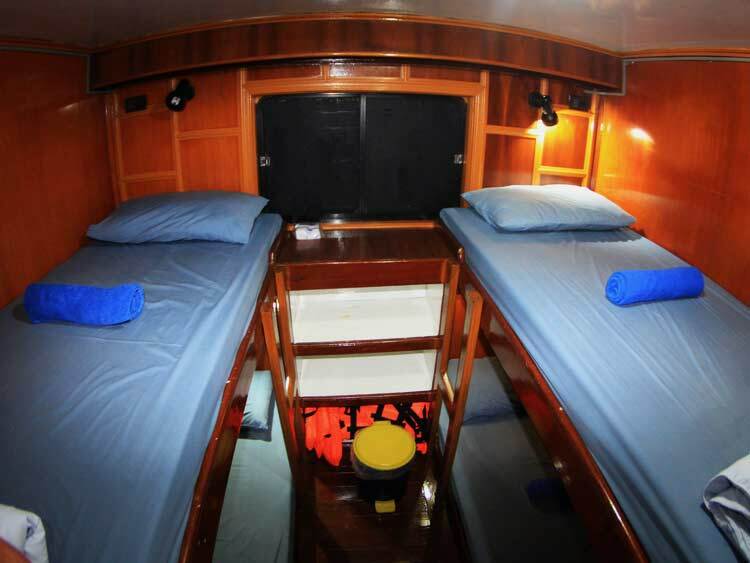 There are three different types available: Twin bed cabins, Double bed cabins, and four bed shared cabins to suit groups and families. 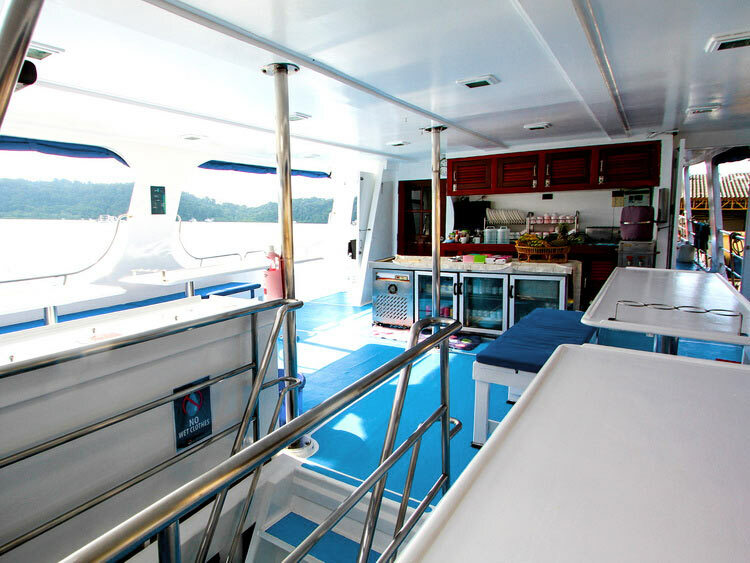 There are also five experienced dive staff members and eight helpful and friendly boat crew members on board to make your trip comfortable and enjoyable. 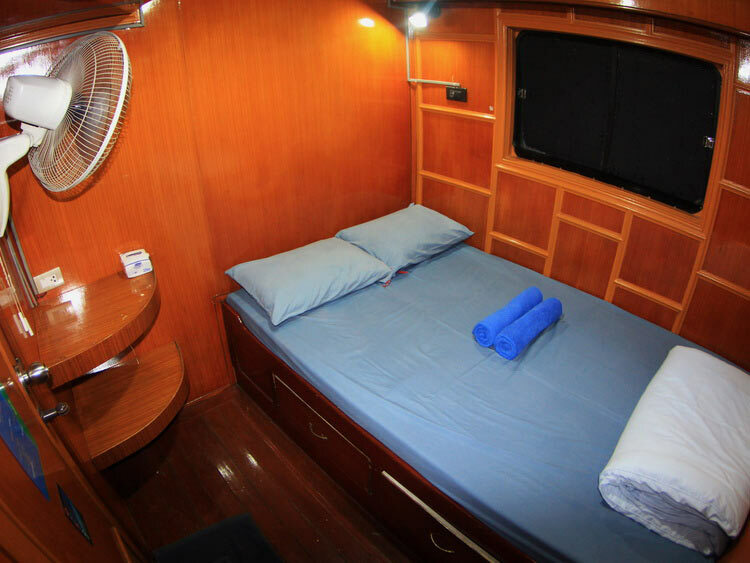 The boat is equipped with all the necessary safety features, VHF Radio, emergency oxygen unit and an extensive medic first aid kit as well as a life-raft, life jackets and –rings, fire extinguishers. 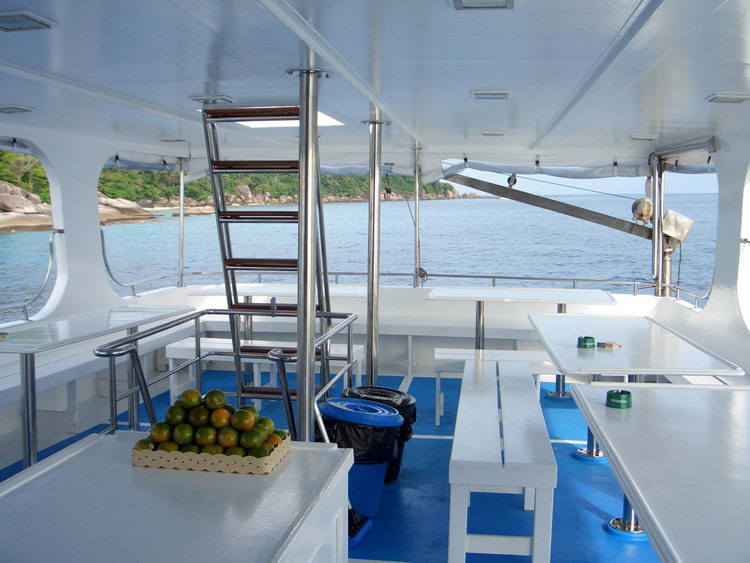 All meals on board on this Similan Island diving tour are freshly cooked in the onboard kitchen by two amazing cooks and are served in buffet style, usually a mix of Thai and European dishes. Snacks and fruits are served between dives and coffee, tea and drinking water are available all the time. Please note that the pick up is a scheduled pick up and not a private pick up. 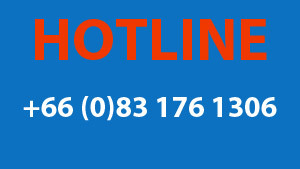 If you would like to be transferred earlier to Khao Lak or on another day we can assist you with booking a taxi transfer. 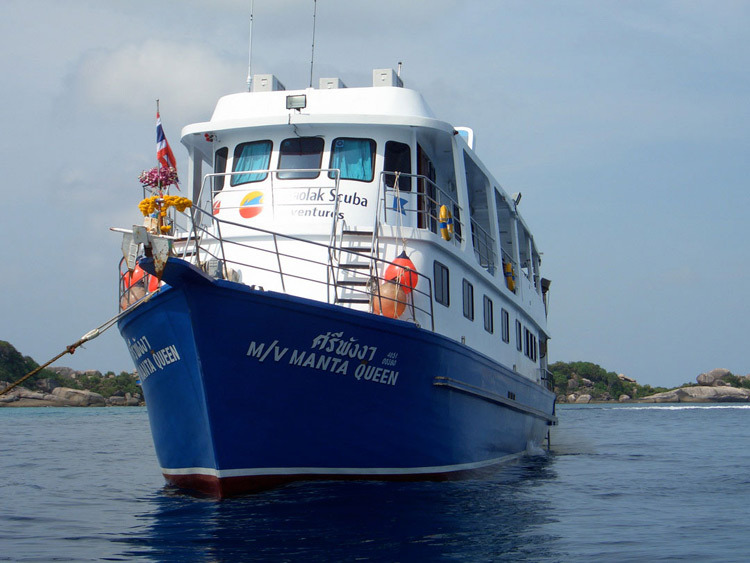 WHY BOOK WITH SIMILAN DIVE CENTER?